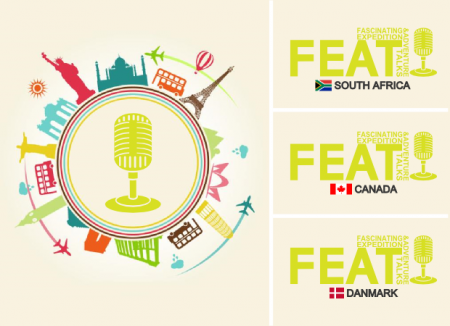 Three countries make up the current FEAT family – South Africa, Canada and Denmark. Although the countries have their own Facebook pages for country-specific content, FEAT around the World is represented by the FEAT Events page. FEAT was born in Johannesburg, South Africa in October 2010. The concept was created by adventure racer Lisa de Speville. October 2014 saw the 6th annual event held at the 1060-seater Linder Auditorium in Johannesburg to an almost-full capacity. The next event is scheduled for Thursday, 8 October 2015 – again at the Linder. www.featsa.co.za and also on Facebook and Twitter. Videos of past FEAT South Africa talks are on the FEAT Talks YouTube channel. When adventure racer Sean Verret heard about the FEAT events in South Africa, they immediately caught his attention. In November 2011 the first FEAT Canada event was held in Vancouver. March 2015 welcomed the 5th FEAT Canada event and the 2nd FEAT Kids event. featcanada.ca and Twitter. Videos of past FEAT Canada talks are on the FEAT Talks YouTube channel. Denmark is the newest addition to the FEAT family. The first FEAT Denmark event was hosted by adventure racer Sanne Elidsbo Hansen in Copenhagen in February 2015. Six speakers took to the stage and the videos of talks (in Danish) are on YouTube. FEAT Denmark has a website and it is also on Facebook.